Want to be part of the revolution — and also get a fat new pair of skis out of it? Build your own. Here’s how to get started. 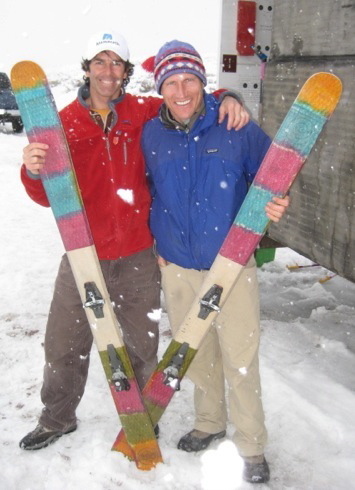 AS PART OF A typically grandiose and splashy roundup in Skiing Magazine entitled “The Future of Skiing: The 28 people, products, and inventions revolutionizing our sport,” writer Rob Story worked up a quick profile of his Telluride neighbor, master custom ski maker Pete Wagner. The dig (coupled with the one that follows) betrays not only a basic misunderstanding of what said dude might be up to, but also of what might actually be revolutionary in the state and future of custom manufacture. I don’t doubt that Wagner’s planks are of exceptional quality, and as meticulously tailored to the individual gentleman-skier as a made-to-measure suit from William Fioravanti. According to Story, Wagner — institutionally-trained as both an engineer and a business administrator — crafts about six pairs of skis a week at a cost to the consumer of anywhere from $1500 to $2000. I’m sure they’re awesome. I’d be thrilled to own a pair. I’d even put ’em to good use. 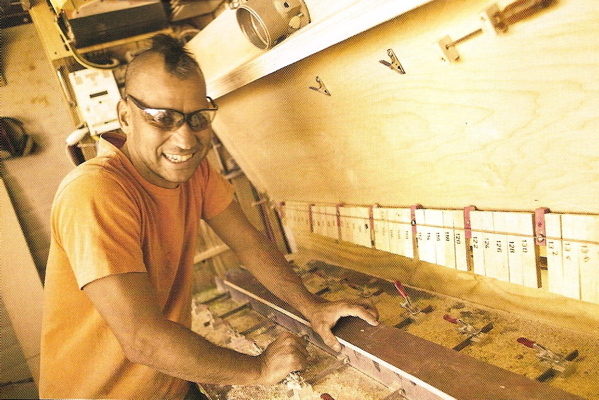 Michael Lish — that’s the mohawked dude’s name — is not selling craftsmanship. He’s not selling overhead or pedigree or attitude. He’s not even selling (and this is where he’s raised some ire in TGR Forums) skis. In essence, he’s not selling anything. He’s giving it away. Sure, you can push your way to the top of Lish’s long list of orders-yet-to-be-filled, you can hunt him down wherever he happens to be camping, put in a day or two of your own labor, as I did last fall, using his tools and assembly process, his hard-fought expertise, plus whatever materials he has on hand, in exchange for $333, and thereby build yourself something unique to ski on. But again, that’s not really the point. You could just as easily, or more easily, as quite a few of Lish’s critics (and briefly wannabe customers) have pointed out, pick up a pair of fairly clean mass-market boards from last year’s demo stock at about the same cost (to you), and, in Story’s sense of economy, not waste any time at all thinking about how your skis were made (or shipped or marketed or marked up and/or eventually discarded as excess to make way for the next season’s shipment of basically the same thing in a different package). Alternatively, you could join the revolution, get together with a group of friends, invest about $1,000 for a kit — about half the upfront cost of one fine-minted pair of Wagner skis —, find some extra garage space or a trailer you can gut and haul around behind someone’s truck, and start your own micro ski factory. The do-it-yourself approach allows you not only to customize your graphics, but to tweak specs and materials according to how you want to ski, to fill out your quiver economically, and at the same time take direct responsibility for your energy use and the sustainability of your materials, to keep your money out of unfair labor practices, and ultimately to cut out the whole wasteful chain from traditional industrial manufacture all the way to retail. Don’t want to waste precious wintertime on it? Do it this summer. Here’s the gist. It’s not too late: Matador Trips lists ten places where spring and summer are still ski season. For more indie ski goodness, check out Sick Freeski, Straight From the Midwest.